Alameda County District Attorney Nancy O'Malley beat civil rights lawyer Pamela Price by 20 points in Tuesday's primary election. In most races, the 59.6 percent of the vote O'Malley garnered could be viewed as a commanding win. But seen geographically, the results reveal a county that's sharply split along lines of race and class. Low-income communities of color in the urban flatlands that stretch from Hayward through Oakland to South Berkeley voted mostly for Price. Affluent and whiter communities in the Berkeley and Oakland hills, and the eastern suburbs of the Tri-Valley and Fremont chose O'Malley. Those who closely followed the election say this pattern likely is due to the fact that Price, a longtime Oakland resident, isn't well-known to voters outside of Oakland and Berkeley. But the results also reflects a desire in communities of color to reform the criminal justice system, say advocates. For other groups, particularly affluent households in the hills and the county's eastern suburban cities, this isn't seen as a priority. "To see so many people vote for Pamela Price, it clearly shows that they want change," said Prince White of the Urban Peace Movement," an Oakland-based nonprofit that organizes with youth of color around economic and criminal justice issues. "They don't like the status quo and the racial disparities in the system." White's group didn't support either candidate but did conduct nonpartisan voter awareness events for the DA's race. "If you've been impacted by the system, or known people who have been impacted, you want some change," he said. Of all populations in Alameda County, Black people are the most disproportionately harmed as crime victims and as defendants in criminal cases. Blacks account for roughly half of Alameda County's jail population, even though they're only 12 percent of the total county population, according to data compiled by the Vera Institute. In the county's Black neighborhoods, complaints of racial profiling and excess force by the police are common. And young Black men are far more likely to die of gun violence than other groups. Cat Brooks, a prominent Oakland activist who is running for Oakland mayor, said the fact that Price won nearly every precinct in the city's majority Black and Latino neighborhoods was unsurprising given the problems in these areas. "The flats are where the majority of Oakland's Black and Brown people live, and those are the people who suffer under a system that over-polices, over-prosecutes, and over-incarcerates them and their loved ones," said Brooks. Throughout her campaign, Price told voters that she would focus on policies designed to end mass incarceration, such as sentencing reform, ending the cash bail system, and expanding alternatives to jail like diversion programs and restorative justice. Election results indicate that this message resonated with voters in neighborhoods like Oakland's Arroyo Viejo, which is 60 percent Latino and 30 percent Black. One-third of the residents in the area live in poverty, as defined by the U.S. Census. An overwhelming 80 percent of the neighborhood's ballots were cast for Price. But her message didn't translate into votes elsewhere. Across the county in southeast Pleasanton, where Black people account for less than 1 percent of the population, according to Census data, O'Malley carried most precincts by 70 to 80 percent. In fact, not a single precinct in the suburban, homeowner-majority cities of Pleasanton, Dublin, and Livermore voted in the majority for Price. Most precincts in Berkeley City Councilmember Kate Harrison's district went for Price, however. Harrison, who endorsed Price in the race, said her district's residents are solidly behind the movement for criminal justice reform, but that voters outside of Oakland, including even some parts of Berkeley, may not have been familiar with Price and her message. Harrison said that while O'Malley is a relatively progressive district attorney, Price spoke to the concerns of marginalized groups. "I respect O'Malley's focus on domestic violence," said Harrison, "but she hasn't focused as much on issues like the school to prison pipeline, which is a major concern in communities of color." 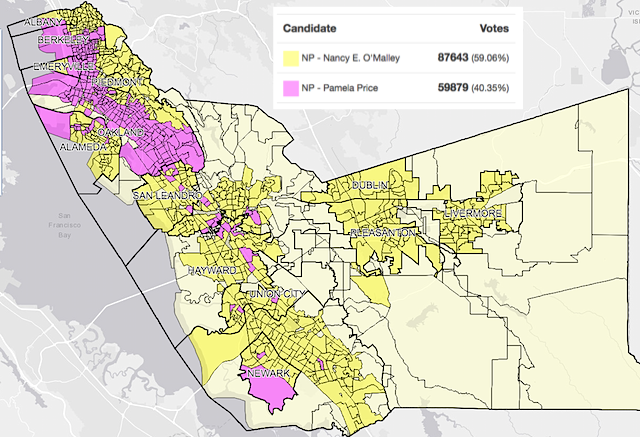 The city of Berkeley was just as evenly split as the county, with neighborhoods in the west and south (where the city's Black population is largest) siding with Price, and North Berkeley, Elmwood, and Claremont (all wealthier and whiter neighborhoods) picking O'Malley. "I think Nancy O'Malley really needs to speak to this divide," said White. "The DA is the DA for the whole county, so she has to govern for everyone." Pastor Ben McBride works within the East Bay's Black and Latino communities on violence reduction programs and has led procedural justice trainings for police departments to prevent racial profiling. He said the election results show several complex splits that reformers need to address before they can win. "One of the things that started becoming clear in this race was that it was being experienced through two lenses, the perpetrator and the victim," said McBride. According to McBride, communities that are struggling with how to reintegrate formerly incarcerated people, and deal with problems of structural poverty and unemployment, were more aligned with Price's reform narrative. On the other hand, communities for whom victims' rights are more of a priority were much more likely to vote for O'Malley. But complicating these opposing narratives is the fact that many crime victims are people of color who are simultaneously negatively impacted by race and class inequalities in the criminal justice system. "This is a real, tangible fracture in our coalition that's trying to invest in determining what 21st-century public safety should look like — our inability to hold these two narratives together," said McBride. Another issue that could have been detrimental to Price is that many of her potential constituents could have been demobilized due to negative experiences with the police, McBride theorized. "Negative interactions in communities of color with the police actually leads to less civic engagement," he said. "If someone's most common interaction with government is a negative one with the police, it can delegitimize the government for them. They come to feel that their agency around voting won't actually create a different system." White said he's seen this reticence firsthand when trying to mobilize young people of color to vote in local elections, particularly for offices like district attorney. Price's campaign came at a time when reformers across the country are running for district attorney on reform platforms. But the movement has had mixed results. The district attorney races in Sacramento and San Diego ended similarly on Tuesday night, with progressive challengers failing to unseat more traditional prosecutors who were backed by police unions, business groups, and victims' rights organizations. Asked what this means for reformers, McBride called Tuesday's election a "day the system won." "But we can't turn back now," he added. "We're going to have to go deep with our communities and figure out what kinds of leaders they want serving them, and then we'll have to help bring those leaders forward." "We need to keep running people," he said.